The folks at Zooniverse have another great project on the go, this time focusing on Mars. At Planet Four, scientists would like you to identify and measure features on the surface of Mars by examining images taken of the southern polar region. In particular, you’re being asked to look for “fans” and “blotches” on the Martian surface. The current thinking is that fans and blotches indicate wind direction and speed. By tracking them over the course of several years, planetary scientists can get a clearer understanding of the Martian climate. The aggregated data from the image analysis will provide the first large scale measurement of wind on the fourth planet from the sun. For a detailed explanation of how fans and blotches are formed, check out the About page here. 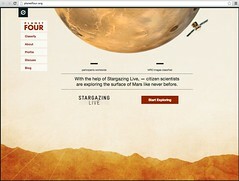 To sign up and start (virtually) cruising Mars, use the sign up link in the upper right corner of the Planet Four site, or use your existing Zooniverse login. Other Zooniverse projects featured here on Citizen Science Center include Solar Stormwatch and Old Weather. On Jan. 19, 2006, NASA launched New Horizons to investigate the outer edges of our solar system. Some 2300 days later, the craft is just halfway to Pluto, on approach for a flight past Pluto and its moons in July 2015. Once it is done it’s Pluto-Charon work, New Horizons may be retargeted for an encounter with a Kuiper Belt Object (KBO). Discovered in 1992, the Kuiper Belt is a massive region of rocks, ices, and metals that stretches from the orbit of Neptune to an area some 50 AU beyond the Sun. Your job, should you join the good folks over at Ice Investigators by Cosmoquest, is to look over some of the many thousands of images we have of the region to find a good target for a New Horizons flyby. Ideally, the target will be at least 30 miles (about 50 kilometers) across, and be suitable for taking high resolution images, doing infrared spectroscopy and four-color maps, and looking for an atmosphere and moons. You can get started with the Ice Investigators project by logging in and marking KBOs on the images provided; you’ll be looking for white, clearly defined blobs against a background of stars, cosmic rays, transients, and asteroids. Cosmoquest is also responsible for the Moon Mappers project discussed in a previous article. It must be tough being a meteorologist right now. Previously, if you had predicted rain on someone’s wedding day and you were right, your name was cursed. If you we’re wrong, you were laughed at. These days, however, meteorologists face more than just the wrath of a dampened public. With the debate over climate change still raging, researchers face pressure and intense scrutiny from special interest groups, politicians, and the media. What’s the best way to deal with all of this interest? Get more data and use it to improve existing models. That’s where you and the Old Weather project come in. Researchers want you to review and transcribe some of the thousands of ship’s logs left behind by the world’s great naval expeditions. The logbooks are a vast treasure trove of data points about oceanic conditions, and how the oceans behave over time is key to understanding global climate patterns. Indeed, in one of life’s great ironies, the weather data captured by Captain Robert FitzRoy of the HMS Beagle is now as of much interest to science as the zoological data taken down by his passenger, Charles Darwin. Why can’t the logbooks simply be scanned? While modern scanning technology is good, it would have a tough time reading and recognizing handwriting, and especially the handwriting done on a pitching deck. And who knows what interesting tidbits you might uncover besides weather data? To get started, register for an account (please note that Old Weather is part of the Zooniverse program, which includes GalaxyQuest, studying the ancients, and Whale.fm) and then watch the tutorial videos here. British Columbia, Canada is famous for its freshwater lakes, and two in particular are proving to be of particular interest to scientists interested in learning about life on other planets. Pavilion Lake and Kelly Lake, located about 250 kilometers from Vancouver, are full of microbialites: carbonate structures that form in water with the help of microorganisms. Most current examples of microbialites are found in harsh environments that don’t support other life forms; all other microbialites studied so far are in fossil form. These lakes are not only non-extreme environments that provide excellent research opportunities, they have an amazing diversity of microbialite structures. Learning more about the microbialites in these lakes will teach us more about the biogeochemical processes that were active during Earth’s early history and potentially on other planets such as Mars. The lakes are also Mars analogues in another way: exploring them requires specialized equipment and life support systems. Scientists are using a combination of human explorers and robotic equipment to gather data (e.g., SCUBA, autonomous underwater vehicles (AUVs) and submersibles). The GetMapper project is where you come in. Researchers need your help in tagging the many photos they have of the lake bottoms. All you need to do is register for an account, take a quick tutorial, and then choose the tags that best describe what you’re seeing. The site is thoroughly gamified, and you can compete, earn points and unlock achievement badges based on your work. You’ll be in good company: since the project opened, more than 1 million photos have been tagged.